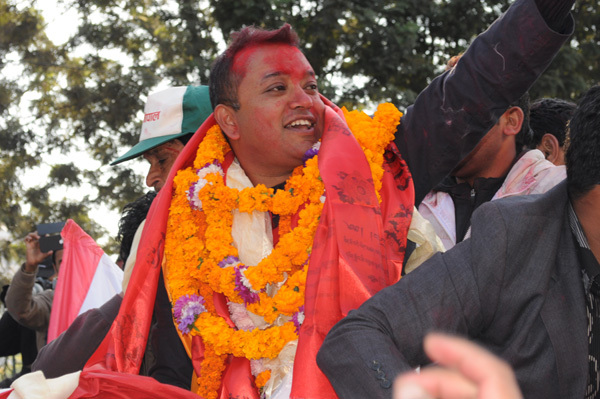 The Nepali Congress regains its lost glory by emerging as the largest party under FPTP category from the Constitution Assembly election 2070. Although voting results of PR election constituencies are still awaited, Nepali Congress which has won 105 seats out of 240 seats. It seems to be the emerging biggest party of Nepal under first-past-the-post (FPTP) electoral system. However, it failed to win coveted 121 seats (Needs to majority) to gain under FPTP. With this, Nepali Congress, which has won miserably the 37 seats under FPTP category in the CA election 2008, so that, it has generally lost its glory. But, although, CPN (UML) has also emerging second biggest party in Nepal, under the FPTP category. It currently leading in the category of PR (Proportional Representation) vote counts, which could eventually see it to be the emerging as the largest party when the final results come out of the CA 2013.